Chris Christensen: Amateur Traveler, episode 429. Today, the Amateur Traveler talks about bush camps, the big five and safari guides as we go to South Africa on safari. Chris Christensen: Welcome to the Amateur Traveler. I’m your host Chris Christensen. Before we get into this week’s interview, just a couple mentions that one, we still have space on the trip to Morocco next April, April 2015. Also, if you are a company looking to connect with bloggers and podcasters and other content creators like me, check out bloggerbridge.com. Chris Christensen: I’d like to welcome to the show Susan Portnoy from theinsatiabletraveler.com who’s come to talk to us about South African safaris. Susan, welcome to the show. Susan Portnoy: Thank you, Chris. Great to be here. Chris Christensen: I see South African safaris, plural, you didn’t go on a dozen South African safaris, you actually went on one and where did you go? 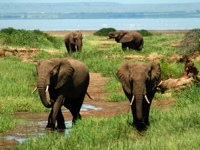 Susan Portnoy: I went to a wonderful area in South Africa called the Timbavati Game Reserve. Beautiful place. Chris Christensen: Now, Timbavati is not one that I know. Most people go to Kruger, or at least that’s the one that I’ve heard of most often. Why did you choose Timbavati or why did your tour company choose Timbavati? Susan Portnoy: Well, the tour company that I went with called Wild Eye, is known for its photographic tours and photography is a big part of what I do on my blog. Timbavati is known for its dense population of certain types of predators, leopards being one of them and they choose areas that really have a wonderful mood and a quality that makes your photography even better. Kruger, while fantastic, it’s a big tourist attraction and you can’t get the same experience there, in my opinion, that you can get in other areas of South Africa. Chris Christensen: OK, and so for the rest of this conversation, when we talk about shooting the wildlife, no actual wildlife were harmed in the making of this podcast. Susan Portnoy: That is correct, that is correct, only photographically. Chris Christensen: OK. Tell us about the experience. First of all, getting to South Africa, anything we should talk about in terms of the logistics of actually getting out there. You’re doing this on a tour and therefore you’re being met at the airport and everything is all handled for you, I assume. Susan Portnoy: Exactly. It was very simple. I actually went through Amsterdam but there are direct flights straight to Johannesburg, and then the Wild Eye team picked me up from there and we drove about six hours to Timbavati. Chris Christensen: OK. And direct flights, like from the U.S., I believe from Atlanta is the one place that I want to say has direct flights. Are there other flights from your area, up from New York City? Susan Portnoy: Yes, absolutely. JFK has a direct flight on South African Air. Chris Christensen: Excellent. If you wanted to go to Timbavati on your own as an independent traveler, do you know whether that is possible, doable? Susan Portnoy: Absolutely. There are a variety of lodges there that cater to travelers in the same way that you might find them in any other area of Africa or around the world. I chose to go with Wild Eye mainly because of their expertise in photography, because I know some of their photographers, having followed them on Facebook and other online media. Because I was looking to improve my skills as photographer as well, so there was a lot of things that sort of brought me to wanting to work with them instead of going on my own. Chris Christensen: And this was not your first safari? Susan Portnoy: No, actually this was my fifth safari. I’m a tad addicted I have to admit. Chris Christensen: And I knew that, but I wanted to make sure that everybody else did. Susan Portnoy: Yes, I have a problem. Chris Christensen: You’ve done that already. Why did you go back and do another safari? Susan Portnoy: I love safaris because I have a real passion for wildlife in general. I find that countries in Africa and the experience that I have had in Africa, the beauty, the serenity that I have found there has been a great anecdote to my day to day life in New York City and it’s something that’s drawn me back. Also, the level of skill that one must have to do any kind of decent wildlife photography has me constantly wanting to improve my skills and I get a little addicted to things like that. I’m a little competitive with myself so it’s a variety of things but I really find that Africa is one of my favorite places on the planet. Chris Christensen: Excellent. Describe for us this experience. Susan Portnoy: The best way I can explain Timbavati is that it has a beautiful, stark and rugged quality to it. It’s very different than one who is familiar with Africa via movies like Out of Africa or NatGeo segments where you’ve seen the migration, where you have these wide open spaces and huge skies. Timbavati on the other hand is very rugged. It is filled with sand and dense bushes and dead trees that have these wonderful shapes and thorny acacia and it just gives this incredible mood and difference to photography than you might see elsewhere. That was one reason. I wanted sort of a different experience than I’ve had in past. I was most recently in 2013 in Kenya which had that sort of Out of Africa feel and I wanted something a little different and something that would make this trip’s photography stand out from those that I have done before. One thing I can say that was most important, South Africa in winter, which it is there now, it gets really cold. I knew it would be cold. I didn’t know that it would be really cold and it’s one thing when you bundle up and you’re going to go out into a Jeep and out into the bush. There’s a romance to that, where you’re bundled up and you have your equipment. What I didn’t really understand and what’s good to know is that you’re going to be sleeping in that cold too because most lodges, even the most high end lodges, aren’t heated. My particular camp, which is called the Umlani Bushcamp, was a delightful but simple accommodation and it had an open air quality to my room. Not even a quality I guess, it just was open air. It got a little hard to sleep at night. Chris Christensen: You described an open air sleeping environment in a place known for its predators, so I have a little problem with that, just a second. Susan Portnoy: …and that is a rounded, rondavel architecture. If you think about a circle and you split that in half and one half is the side where your bed and your little dresser and all those things are. The other side is where your en suite bathroom is and the shower. The part with the shower is fenced, so the fence is a bamboo fence and it’s very, it blends into the environment really well, is very high so it’s not as if a predator could jump into it. Susan Portnoy: Well, leopards actually jump very high considering they hoist their kill there, but the good thing is that monkeys can come in. There’s other things that can come in but truthfully, just like we’re not searching to go hang out with a leopard as an individual on the ground, most animals don’t want to come into places that might smell differently than they expect, which humans do smell differently than what they’re used to. I can say that we had leopard tracks and Genet tracks, which is another small, it’s a small cat, porcupine. They were all outside my door one morning, which was fascinating and I loved it, but I wasn’t ever worried that they would ever get in or more importantly, I was sure that they wouldn’t really be interested in getting in. Chris Christensen: You get up in the morning, and I’m guessing this is one of those safaris where you’re going to get up relatively early because that’s when the animals are up? Susan Portnoy: Exactly and from a photographic point of view which works out perfectly, early mornings and late in the afternoon is also the best light. The fact that the animals are at their best, it’s perfect. Yes, we would get a wakeup call basically that would consist of our guide, his name was Elvis, he was delightful. Chris Christensen: So now we know where he is. Susan Portnoy: Yes, exactly. He was in the building, in the bush. He would come in and just say a quick hello and usually around 5:15 a.m. and the night before we would arrange whether or not we’d meet at 6 or 5:45 depending on what we wanted to do for the day. You get ready. I typically dressed under my covers. I found that that was a very good strategy for keeping warm. After I got dressed, I would head to a local meeting place within the camp called the boma. It is a fenced in area, beautiful fenced in area, not a chain link icky fenced in area where a fire would be. We’d have a little hot cup of cocoa or tea and some biscuits or muffins and just wait till everybody congregated. Jump into our jeep and head out into the bush which would be four to five hours depending on our sightings, the weather, our interest and so forth. While we were out there, we would stop at some point along a lovely watering hole or a particular clearing and we’d enjoy another cup of tea or hot cocoa with some more biscuits and just stretch our legs and enjoy the scenery. Pop back into the Jeep, go out for a little longer and then when our first game drive was over we’d head back to the camp where we would have breakfast and so forth. Chris Christensen: Let’s talk a little more detail about the game drive because I’m not sure that everyone has the same mental picture. You mention hopping into a Jeep and so you’re spending most of the time in a vehicle, but I’m picturing this is one of the vehicles where the top opens up and you’re standing up when you stop at a place to take pictures. Susan Portnoy: No, you don’t stand up. It’s not a great idea amongst wildlife to stand up in a Jeep. In South Africa, the Jeeps are different than in other countries. It is completely open. This Jeep could accommodate nine total people. We were somewhat less because we wanted room for our camera equipment and our blankets for the early morning when it was really quite cold. When you go out into the bush and you should come across an animal, the one thing that’s really important is that all camps and usually across Africa, there are some very basic rules. Which is when you’ve stopped to see a sighting of a predator or a zebra or anything else, it’s their main interest, of course, is your safety. The next is the fact that they don’t want to stress out whatever wildlife you may be watching so you want to be calm. You want to speak in a soft tone. You don’t have to whisper but you don’t want to be loud, and you definitely don’t want to get up because it can be startling to the animals. Even if it’s not something that could arouse a dangerous situation, you don’t want an animal running away. You’re trying to watch them, so it’s important to be very calm and to listen to your guide and to your driver because they are very attune to how the animals are behaving and if they’re feeling stressed or if they are exhibiting behaviors that might lead to aggression. They always help you through it. I’ve never felt, ever, in danger on any of my safaris. Chris Christensen: Now, you and I talked about this offline, so we had talked about the difference between the safari that I did. I’ve only done one in Tanzania, where you are standing up in the Range Rover and the top pops up, versus the one that you did with the open Jeep. I couldn’t help but think of the one point that we’re in Ngorongoro Crater and the female lioness walks just right next to the vehicle and roared or growled in a fashion that reminds you that you have not always been top of the food chain. Susan Portnoy: It wasn’t a happy hello growl? Chris Christensen: There’s a certain visceral response and I was a little glad that I was not in an open Jeep and just able to reach over and pet the lion. How does that work with seeing predators in particular? Leopards are a little different because they are going to tend to hunt smaller game but some of the big cats, the lions, actually can take down a person if they were so inclined. How does that work in an open Jeep? Susan Portnoy: Well, the thing about open Jeeps and traveling, any kind of Jeep, actually, in areas like the Timbavati or any area where lodges exist and animals and throughout their generations have become somewhat acclimated to the presence of a Jeep, there’s less fear by the lion as long as people are behaving correctly and following those rules. They get close. I’ve had a leopard walk five feet up to the Jeep and it was my responsibility not to do anything that would be startling, not to speak loudly. Not because I thought it would attack but because I don’t want to start a snow ball of a situation. Again, typically they sort of behave as if you’re a fly on the wall. They’re aware that you’re there, obviously, but a lot of times they just continue what they’re doing, which a lot of times is sleeping. They may hunt; they may interact with each other. It’s kind of like you’re not there and the assumption is that animals that have gotten acclimated to Jeeps think of the Jeep as one solid creature. Now, a bunch of people within a car, and so if you remain seated and quiet, there’s no reason for you to draw attention to them to something that they’ve already become very comfortable with. There is a lot of safety and I feel very comfortable with that. Maybe I’m a little crazy. I kind of love it when they get near. My biggest problem is the incredible desire to jump out of the Jeep and hug them, which I know would not end well. I think anyone who might have reservations, they shouldn’t. As long as they know that they are the type that will pay attention to the rules. Chris Christensen: Now, you’re of course not assuming that they’re going to get within five feet of the Jeep so I believe you’re carrying a … the lens that I saw in the picture that you sent, I want to say it’s as long as my arm. That’s a little exaggeration but it’s probably as long as my forearm. Susan Portnoy: It’s a long lens, yes. I have a lens, I rent it because it’s a fantastic lens and so fantastic that it’s ridiculously expensive and I really couldn’t afford to buy it. The wonderful thing about a variety of companies out there is that you can rent lenses for a fraction of that cost. This one was a 200/400 lens that really gave me a lot of range to shoot animals that are far away. It’s eight pounds, so added to my camera which just has one or two pounds, handholding that can prove to be difficult, so Jeeps like the one you’re talking about where you can put a sandbag and rest the lens up on the Jeep is the best way to go. I had to learn to be a little stronger and I also had the use of a monopod to help keep it steady. That’s what I used the majority of the time because it was a telephoto lens and gave me a lot of flexibility but I had another body with me which had a shorter lens. I had a couple other lenses that were wide angle and some different lengths that would give me flexibility depending on the situation that I took with me all the time, as well as the other guests on the trip. Chris Christensen: OK. You’re on the morning game drive. Describe for us a moment when this, when you realized this would not be your last safari, this is just the fifth of many. Susan Portnoy: There was one morning where we had heard about a group of male lions that had killed a buffalo and were sighted in a property near us. We were headed that direction and we were all excited and when we got there, there were four beautiful, I mean just incredibly beautiful lions that were sort of lounging around. You could tell that they’d had their fill. However, one lion was there, sort of still munching. There was this gorgeous, golden light from sunrise. There were birds singing, the light was fantastic and I couldn’t believe that there were four lions in front of me. I mean, no matter how many times I’ve done it, it’s still exceptional to see these things. I mean, they’re just beautiful and then one heard another lion in the distance and so he started to call back and that sound is just extraordinary. Every time I get that, it truly is a rush. I make a joke about being addicted to Africa but I kind of think I really am. I mean, I get such a rush from it that I think I have an endorphin thing that while other people get it through exercise, I get it through going on safari and it’s kind of a hard addiction because it’s not inexpensive and it’s certainly not next door, but I still plan to go on more. Chris Christensen: Now, we started describing your day. You’d go on the morning safari and then you’d come back and take a break in the middle of the day when there’s less going on with the animals. Susan Portnoy: Exactly. We’d get back and we would typically have breakfast and then we’d have three or four hours to do whatever it is that we would want. I would do a combination of things. I typically always try to download whatever photos I’ve taken from that morning just to make sure that I have them backed up in case later in the day I should do something stupid and lose a card, a memory card, or corrupt it somehow. I’m a little paranoid that way. I would also take an opportunity to perhaps take a shower. It was an open air shower and thankfully during mid-day when the sun came up it actually got warm enough for T-shirt weather, so that was typically the time that I would save to take a shower. We’d have lunch. We’d visit with each other and I also took the opportunity to speak with the leader of the group. A wonderful wildlife photographer named Marlon du Toit and he would help me sort of look at my photos. Talk about other ways that I might have approached it, different ways that we could have looked at it from focal length. He also offered me some great post processing tips for things like LightRoom and Photoshop that I’ve taken with me and I think have already helped me work. Chris Christensen: Excellent. With the first part of the things you mentioned there in terms of other ways you might have approached it, examples of this sort of things you learned from him. Susan Portnoy: The first night that we arrived, we had an afternoon drive. We arrived around 2, our first drive started around 3:30 so we were getting into the sun coming down and it being a little more twilight. There was this beautiful leopard. She has aquamarine eyes. Her name is Rockfig, not the most beautiful name for such a gorgeous leopard, but refers to where her mother was born, under a rockfig tree. Rockfig was there and she was sort of lounging about. She had an impala kill and I was shooting it from a little pulled back where I was showing more the dense foliage around her and making it more sort of leopard in the environment shot. I got so kind of wrapped up in that, I didn’t think about getting even closer and closer into her. When I saw Marlon’s shot later, he tends to shoot things in a very romantic, intimate way and his preference is to get really tight. I loved that perspective and I wanted to hit myself for not having thought of it in the moment, but that’s where some of the excitement comes from and the challenge, because you get so wrapped up in what you’re seeing sometimes you forget all the different things that you could do to mix up the ways in which you’re photographing the wildlife. Chris Christensen: We’ve talked before on this show about travel photography. In general, one of the ideas that I like is thinking like a cinematographer, where you get your wide establishing shot, your mid-range shot and then your close up, which is just the whiskers basically of the leopard, very close and intimate. Susan Portnoy: Absolutely. I mean, that is always the best way to approach all of it. Any kind of travel photography, whether it’s wildlife or street scenes or things like that, but it’s just one of those things where you get kind of caught up not only in the fact that you’re seeing a leopard. There’s a lot to doing wildlife photography besides the fact that it’s not … you can’t move. Once you’ve sort of got the Jeep where you need it, a lot of times the Jeep is positioned in the only way that it can be positioned because of the surrounding environment. It can be difficult to have the best case scenarios in terms of trying all those different things, but without question, I kind of dropped the ball there. I loved being able to see the way that he approached it because it reminded me later to do it myself. Chris Christensen: Well, and one of the problems with travel photography is that when you do miss that shot, it’s way the heck over there and I will confess that I’ve done worse than you just did. That is at my recent trip to Petra in Jordan, I managed to try and shoot Petra at night and not realize that I had left on my polarizing filter and therefore I had sunglasses on my camera. You can imagine that that does not optimize your night photography. Didn’t discover it till the next day. Susan Portnoy: Makes it challenging. I’ve done things like that. I’ve done things exactly like that, had my settings that were set for very dark circumstances and of course the next morning forgot to change it and something’s running in the beautiful sunlight and it’s a perfect shot and of course, I’ve perfectly missed it. Chris Christensen: Yep. You are an old hand now at safaris. This is your fifth safari but what surprised you? Susan Portnoy: I always think that what I find interesting and new on any safari is my continued understanding of animal behavior. You can only retain so much. You’ve got so much going on when you’re trying to shoot, see, enjoy, be with the other people in your group, that you can’t retain everything and so over these last five safaris, I’ve just learned so much more about how animal behavior fits into the scheme of things. From a photographic point of view, aspects of the way that they’re acting can tell you what they’re about to do, which is huge in anticipating a shot. I’m always surprised at how human they are and I know that most people would poo-poo anthropomorphizing animals but I’m sorry, I’m the biggest anthropomorphizer on the planet. I’m really convinced they have a lot of conversations in their head and I often tend to voice what I believe their inner dialogue is. To the chagrin of my friends on the trip, I would often vocalize my request for their behavior. I would ask them “Could you move a little to the left, could you look this way, please, could you do this.” And I am telling you, I was really good at it because by the end of the trip, people were asking me to ask them. I found that surprising. Susan Portnoy: I’m a little Dolittle. Chris Christensen: You’ve been on five different trips. What kind of safari would you recommend for someone’s first safari experience? Would this be the perfect experience or more like what you had done in Kenya or what? Chris Christensen: They’ve even heard of wildebeest. Susan Portnoy: The big wildebeest, those big open spaces, the huge, huge skies and not that Timbavati didn’t have those skies, but because of all the trees and the foliage, it doesn’t have that same kind of impact that you do when you can look straight out seemingly for hundreds of miles. Places like that, Kenya. I was in a wonderful place after this particular trip to Timbavati called Amboseli, which is also in Kenya, where herds of elephant are just everywhere and it has that quality. I think that depending on how a person fantasizes about Africa and what they’ve seen, that would probably be the kind of trip I would recommend for someone first staring out. Chris Christensen: I completely can relate to that because again, Tanzania, only one safari but three different parks. The first park we went to was more what you’re describing more closed. There are trees around and we saw lots of elephants for instance, and I have one of my favorite pictures of elephants of this close up of an elephant from that park, but it was the next day when we got to Ngorongoro where there were herds of wildebeests and herds of zebras that my brain finally went oh, this isn’t a wild animal park. You’re in Africa. Susan Portnoy: Right, exactly. I know exactly what you’re talking about and the first time I’d ever … my first safari actually was in South Africa and it was a long time ago and I really didn’t do the type of research that I tend to do now. It wasn’t literally until I got into the Jeep in South Africa that I realized it wasn’t the Kenya experience. It was fantastic and it was certainly the start of my obsession, but I really kept thinking, oh my goodness. I guess Africa isn’t all just these wide open spaces. It was lovely but there was a second there that there was a disconnect for me. Chris Christensen: Interesting. Although for me, I think the establishing a film for Africa is probably the Lion King, so I’m expecting the songs in the background, but that’s an entirely different problem. Susan Portnoy: Well, you’d be amazed at how many guides and different locals will just break in Hakuna Matata, because every time they see an American, they know that we tend to love that show. Chris Christensen: Well and many of the people I have met in Africa too have been very musical. I swear that any group of three Tanzanians can break into four part harmony and I don’t know how. Susan Portnoy: I’m sure that’s true. Chris Christensen: Now that you have done your research, now that you have done five different trips, what kind of advice would you give to someone who’s going on a safari and particularly a photo safari? Susan Portnoy: I think it’s important that if you are into photography, you want to do the kind of research that would give you a good understanding of the leaders. Africa, if you’re going to Kenya, many of the different lodges share the same land, so there’s a good chance that you are going to be in a great place, but from a photographic point of view, you really want to make sure that the person that’s leading your trip, the photographer that’s leading that trip, has an eye and a sensibility and skill level that you really appreciate. Don’t just look at what the promotional website has to say about their work. Look at their Facebook pages. Look at anything else in which their work is presented so that you can get a good idea of the breadth of what they do, and make sure that you like how they shoot because when you’re there, you want to pick up inspiration for angles and mood and all kinds of things that you might miss in the rush of the moment. If that person doesn’t shoot the way you want to shoot someday, it’s kind of a waste. Chris Christensen: Now, you described for instance sitting down during your breaks and learning about Photoshop, learning about getting some critique of your photos and things. How did it make a difference when you were in the Jeep? Susan Portnoy: It helped me to look at the final picture. Professional photographers will always say when you’re in an environment whether it’s street photography or different types of travel photography or wildlife photography, you’ll find that the professionals will often say “I know what I have in mind for the end result of this photo before I start.” I’m not quite there yet, frankly. I have flashes of that but I’m just not there yet, and when you can see images that you’ve done, that when the photographer is saying “You could have gotten this angle a little better or you might have wanted to approach it this way,” and especially when it comes to a kind of cropping kind of thing where the idea is that you want to try to have as much of the cropping done in camera as opposed to having to crop it later in the software. I keep those images in my head and I know a little better what I want to achieve. I hope to get to a point someday where I can really see the final results in my head before it happens and especially in cases like wildlife where things can take place in a matter of seconds. Chris Christensen: OK. Any other advice that you would have for people going on their first safari besides don’t wear a leopard print? Susan Portnoy: Don’t wear a leopard. Make sure you check out what the temperature really is. Just because it’s Africa does not mean it’s warm, definitely. I also think that it’s important that you look at the variety of different lodges and resorts and things that are available. There’s quite a broad spectrum. I think that most people out there see these very beautiful, high end luxury places and they’re extraordinary and I’ve had the pleasure of staying at a few of these, but it’s not the only thing that’s available. There are a variety of camps that are perfectly wonderful at different price ranges, and it just takes a little time to look for that and to really do some research, or find yourself a great travel specialist who has spent a lot of time there who can help guide you depending on sort of what your African fantasy would be. Chris Christensen: You mentioned price and I have had somebody talk to me recently and their assumption was that an African safari would be $10,000 a person, and I’ve known people who have gone on those safaris. When you say a range of price, what are you talking about? Susan Portnoy: Again, it depends on the type of safari, whether it’s photographic or you’re just going as a guest and ending up at a particular lodge. Going on safaris is not cheap, but you can go to places and go for seven to eight days anywhere between five and ten, and whether or not it’s a total of five will depend on, air flight fare is not necessarily cheap. It’s really those kinds of factors, but truthfully it is expensive and it’s completely 100% worth the money, but it’s the kind of thing where I’ve had to make a lot of choices in my life. While my friends at work have buy Manolo Blahnik’s or fabulous sneakers, I’m buying tickets and that’s kind of where my priorities lie. Chris Christensen: Well and there’s not a lot of great ways to save money on the ticket itself to get there. You’re talking about $1000 to $2000 to fly. Now I found that the trip that you did is going to be a higher end trip because there’s a photographer involved and it’s a smaller group, so that’s not going to be your cheaper trip for sure. We’ve done, for instance, worked with a local supplier and done two and a half day safari for $300 including lodging, but that was a local supplier, not somebody who was having the overhead of advertising to the U.S. for instance. That can make a difference to is if the more you are willing to make you travel plans when you’re in Africa, but that’s not something a lot of people are going to be willing to do. Susan Portnoy: I think it’s a great option to work with local suppliers, there’s no doubt. At the same time, for me, in the types of travel that I have done and what I’m looking to get out of it, location is everything, and the environment and the backdrop for the photography that I want, and it’s hard to know what a local supplier will provide in comparison to those companies that because they have that overhead, they can provide you with more photography and examples of what their particular property provides. I tend to go for a little bit higher cost in order to be sure that when I get there, I’m not going to be disappointed. Chris Christensen: Sure. That’s a long way to go. Chris Christensen: As we go to wrap this up, you go back out again at the end of the day. We’ve got the sunset, we’ve got the Lion King playing in the background. Describe to me you perfect moment. Susan Portnoy: The perfect moment for me typically is after the rush of the whole day, you’ve had dinner, you’ve swapped your stories, you’ve sat by the fire, you’ve had your wonderful glass of wine and I go back to my room and everything gets quiet and I hear the sounds of Africa. I love hearing a lion roaring in the distance. I adore the sound of hyena or any of the other animals that you hear at night. It is something that I will never hear in the States and I revel in it. I will go to bed early just to experience that for longer periods of time and it is one of my favorite aspects of safari in general. Chris Christensen: One of the things we ask with a trip like this is when did you feel closest to home, just most familiar and when did you feel farthest from home? Susan Portnoy: I think the closest I felt to home was certainly in Johannasburg because it’s a big metropolitan city with all the trappings of 21st century life and I stayed there one night just so that I could sort of acclimate before I got picked up for the drive to Timbavati. The farthest certainly would be that moment I described earlier when I’m in my bed, tucked in my bed, and I am hearing the sounds of the bush and the lions calling to each other, and the twigs breaking outside my window, alerting me to the fact that something, I’m not quite sure what, but something was out there and it gives me a thrill and love it. Chris Christensen: I think with twigs breaking outside you just talked three people out of going. Susan Portnoy: You are safe, I swear. Chris Christensen: But I bet about a dozen people just booked their travel, so it works out OK.
Chris Christensen: Before we get to our last question, anything else that people should know before they go to safari, before they go to Timbavati or before they go to South Africa? Susan Portnoy: I think the thing I would recommend the most for someone who’s interested in going on safari is to give yourself plenty of time to plan the trip. It’s not the kind of place that you’re going to say “Hey, next weekend I’d like to go on safari” even if you can afford it, and even if the distance wasn’t as far as it is, at least for the United States. It’s something you want to take the time because it is so far, because it’s probably a little more expensive than you might be taking on other trips. It’s worth a lot of investigation. It’s worth taking the time to look at the websites of the different lodges that you might consider and really make sure that that fantasy that you have in mind is fulfilled through what you’re seeing, because it is a spectacular, spectacular place. South Africa, Timbavati, Africa in general, and you really want to get the most out of it. Chris Christensen: Excellent. Last three questions. Well let’s do four questions. One thing you should pack before you go. Susan Portnoy: I always pack a small flashlight. It is the one thing that no matter where I’m going, and that can be Toronto, Bhutan or South Africa, there is numerous amount of times that I have needed to use a flashlight, whether it’s finding things in my bag late at night on a long flight, whether it’s badly lite restaurants and I need to use it, certainly out in the bush, it’s great to have a flashlight, so that you can know where you may or may not be stepping on things. It is something I always have in my carry-on bag. It stays there, it never leaves. It is one of my most valued possessions and it was even better because it was $5 on Amazon. Chris Christensen: One thing that makes you laugh and say only in South Africa. Susan Portnoy: Well because Timbavati is as dense I mentioned in terms of the trees and the shrubs and there are a lot of these beautiful acacia trees that have sort of a Tim Burton quality to them if you look at them in silhouette, but they have three inch thorns on them. When you’re driving along, there’s always this time when you’re kind of driving through the bush and you’re going a little off road, which means you’re not staying on the main road but kind of driving off, where you’re constantly ducking, moving, holding trees up, moving these things around. It becomes comical after a while, because you’ve got this whole group of people that are automatically immediately shifting right, immediately shifting left, ducking, hanging back, and I think that if people could just see that from a distance and not know what you’re doing, they’d think that we were all crazy. Chris Christensen: Actually, a bonus question here. In Africa they talk about the big five, the lion, elephant, buffalo, leopard and rhinoceros. What are your big five, the five favorite animals to photograph? Susan Portnoy: Definitely without question elephant, lion and leopard. I just recently had my first sightings in a long time of rhino so that was exciting, because it was the first time, but photographically and just because I love watching them, I have really come to love hyena. I find them very entertaining, and recently on this particular trip we were watching a den of hyena where various ages of pups, some very small, they were all black and cute and adorable were playing with their mother. It was just wonderful to see the interaction and the loving interaction that hyenas have, which you kind of don’t think because a lot times hyenas are always shown as these scavengers with their teeth bared and covered in blood. I really found them to be quite endearing this trip. I also love shooting baboon, because they are incredibly human-like in the way that they sit, in the way that they interact with each other and they’re quite comical in general. They enjoy interacting with people from a distance, so I’ve had games of peek-a-boo with them. I’ve had them throw things for me to catch, so that’s always a lot of fun. Susan Portnoy: Oh, they’re gorgeous. Chris Christensen: …that’s just me. They are indeed majestic animals. Last two questions. Finish this sentence. You really know you’re in Timbavati, you really know you’re on safari when what? Susan Portnoy: When you wake up the morning, there is a beautiful glowing read sunrise, there’s fog and mist and an incredible silhouettes of these beautifully and crazy shaped trees that give it a very gothic, cinematic quality. It’s something that I haven’t really experienced elsewhere and it’s extremely beautiful. Chris Christensen: Excellent, and if you have to summarize the whole experience in just three words, what three words would you choose? Susan Portnoy: Cinematic, serene, captivating. Chris Christensen: Excellent. Susan, where can people read more about your travels and see more of your photography? Susan Portnoy: Well, certainly they can visit my blog at theinsatiabletraveler.com. I also have posts that they can find on the Huffington Post. I’m a contributor to Yahoo travel, so you’ll find other things there, as well as having done some guest posts for other bloggers like Green Global Travel and the Solo Traveler. I think probably if you want the broadest spectrum of my photographs, my blog will have it. Chris Christensen: I suspect for those of you watching the enhanced version, there will have been some pictures of animals that Susan took throughout this. A reminder that that is available. Susan, thanks so much for coming on the Amateur Traveler and sharing with us your obvious addiction to Africa. Susan Portnoy: Thanks, Chris, I’ve had a great time. Chris Christensen: I did spot three news stories that I wanted to mention and this week we have an ick, a yikes and a wow. In the ick story, a man was arrested for public drunkenness on Tuesday after he allegedly posted as a TSA screener at San Francisco Airport. He directed women to a private area for pat downs. Security staff reportedly stopped him after they realized two women were searched by the 53 year old without requiring a female guard present. I’m thinking they might want to keep a little closer tab on who is who in the screening area. The yikes story is a story that I had to actually check to see on the onion.com if it was true. You may have heard that Yosemite National Park is built over a super volcano. Bad news for those of you who live downwind from it which would be all of Nebraska. The last time it irrupted I understand it left three feet of ash all over the state of Nebraska and much of the eastern United States. Apparently a three mile stretch of road is melting in the park because the surface of the road, because the geothermal forces below it, has risen to 160 degrees, enough to melt asphalt. Again, for those of you who live downwind, yikes. In the wow story, there’s an 800 square mile area in the dessert of North Africa between the country of Egypt and Sudan, that on the map looks like it should be one or the either and apparently is claimed by neither country. There’s another triangle that’s claimed by both since they don’t agree on what the borders should be, but a man just traveled there to plant a flag built by his daughters, because he wanted to call his daughter a princess. It is not clear what the legal standing of his new country is. For links to all three of those stories, check out the show notes at amateurtraveler.com. I got an email this week from Kristen who is looking for an episode of Amateur Traveler on Slovakia but we don’t have one, and I mentioned that because sometimes the guests on the show are listeners of the show like you. If there’s a place that you have been to that we haven’t talked about, drop me an email to host at amateurtraveler.com. I just interviewed Gina, who’s been a long time listener of the show and we’re going to be talking about Salzberg where she spent some time in college and has been back to recently. So possibly you too can do an episode of Amateur Traveler. If you’re not sure what we’ve talked about, check out amateurtraveler.com/map, and that has a map of almost every episode that we have done. With that, we’re going to end this episode of the Amateur Traveler. Remember there are still spots on the trip to Morocco. Go to amateurtraveler.com and look at the book travel tab for more details about that. If you’re looking for bloggers, check out bloggerbridge.com. If you have questions, send an email to host at amateurtraveler.com. Better yet, leave your comments or questions on this episode at amateurtraveler.com. Join the Facebook community, follow me on Twitter at Chris two X and as always, thanks so much for listening.